Finally found the messenger bag I've been searching for. I really like the color scheme, elk leather bottom and the patches that make this pack unique. I used to just want a traditional leather satchel (think vintage USPS mail bag) but I decided I needed something better because i'd be carrying very heavy books inside. I wanted a classic look - the messenger bag and a classic feel - leather but I needed a modern interpretation complete with adequate padding and a new spin on design whilst keeping a familiar aesthetic. This is what good design is all about in my eyes. Taking the old and improving it's functionality without sacrificing aesthetics. This bag is everything I wanted. It has a great vintage/military olive color, beautiful elk leather and patches reminiscent of old hiking gear. The tech includes Ballistic Cordura Nylon, padded laptop sleeve, RiRi zippers, UTX Stealth buckles and a quick release UTX seatbelt style shoulder strap. 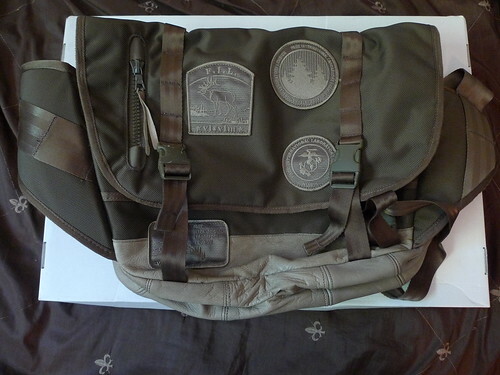 Although I enjoy the bag overall, I am planning on removing or covering the USMC style eagle, anchor and globe patch. Although I do like the visual aesthetic of the symbols, and I have a couple of friends in the USMC right now, I think I can find a patch that better represents me. A link to the Flickr photo set in the full.